2011, I spaced my garlic about 4" apart. I was unhappy with the bulb size at harvest July 2012. I'm thinking it was not only planting to close together, but low fertility. If you fudge the spacing, fertility needs to be there. Fall 2012, This year I went back to 8" spacing in all directions. I planted 5 cloves across and about 20ft long. 150 cloves to the bed. I added more horse bedding mulch to the bed today. I planted this bed of beets and carrots early Sept. I'll have to admit I'm not very good at thinning and I sow to thickly too. So it been over two months and I have only pulled a few carrots. I just went out and pulled some to show. The carrots are looking pretty good, but the beets are mostly tops. I eat the tops same as chard. I envy not only your space but your seasons. We are under 2 feet of snow and -20 C.
I love the updates ! DDF.....I just love your puppy sleeping, must be exhausted to sleep through all that. We do have some snow, but not as much as we could have. No snow here, only 4 or 5 days with frost. We don't get much in the way of snow. Living in a rain shadow and being surrounded by water. We get 1 to 3 inches and rare dumping up to a foot. Life was like that on Vancouver Island where I was born and raised. I seriously love your garden, so beautiful, lots of work though. But gardening is fun. Sometimes I "really" wonder how I got to this freezing place??? Is it too late to plant the GARLIC CLOVES, if I mulch them with wheat straw? If the ground is not frozen, I would plant them. Place the clove so the pointy end is just below the surface. Then cover with a few inches of straw. DDF, The ground is frozen, but the raised bed would be filled with about 2 feet high of well rotted horse manure. So they would be almost two feet above the frozen ground, mulched with wheat straw. Would this work. Green Mantis wrote: DDF, The ground is frozen, but the raised bed would be filled with about 2 feet high of well rotted horse manure. If it's your only option I would do it. Today, out in the rain, I harvested the last of the fruit. Quince and medlar. When I was harvesting the Medlar I noticed the tree leaning more than I remembered. The damn voles are still at it or maybe I have root rot. I stumped the ground all around the trunk and added a T-post for support. Argh, What's that! Two other trees leaning over. I lost a Honey Crisp and Liberty apple. I walk up to them and pulled them out of the ground. Basically no roots. A pointy end and bucktooth chew marks. My replacement trees and all future trees will have gravel around and mixed in. Sorry about your trees, what kind of groundcover do you have? Nice quince harvest, I got about 20 lbs of them myself. what do you do with them. soil wrote: Sorry about your trees, what kind of groundcover do you have? Thanks Soil. 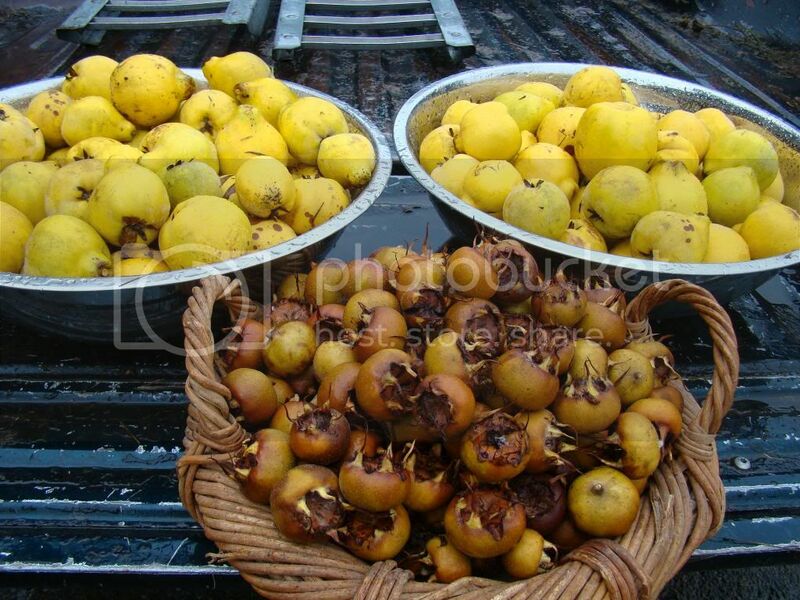 The quince in the photo is about 1/3 of total harvest. I sold 25lbs to a local taquerÃƒÂ­a. My sister in-law is part of a group called Friday Walkers. They took some home. I also sent several gallons home with 3 of my equipment repair clients. I will be making quince paste "membrillo" and quince/ medlar pancake sauce. The ground cover is / was mostly grass and weeds. I've been slowly covering with cardboard and horse manure / bedding. I'm also adding comfrey, clover and other seed to the cover. The voles are now using the cardboard instead of the deep grass for cover. This year has been especially bad for voles in our neighborhood. Those vole-killed trees -- we're they newly planted last spring? Bummer! I remember when I first planted the espalier row trees, I planted native nodding onion at the base (they kind of died after a couple of seasons) but I've been planting Egyptian onions and garlic since then. (this fall I scattered some garlic chives seeds too) One apple tree now has red shiso growing around it and a pear has tansy as a companion. I have a fence row bed on the other side of the espalier fence, and I usually plant climbing beans there in the summer, and planted a row of garlic just the other day. I have no idea if that kind of guild helps with voles though. This fall I planted garlic in a bed just beyond the drip line of my mature Enterprise apple tree where I have comfrey and applemint growing under the tree. It's hard to decide what to plant directly under the tree because whatever it is gets trampled while I walk around looking up at the tree. I started out with some daffodils, but that turned out to be a serious mistake. Yea I'm with applestar you need more groundcover species, try adding some root cros, greens, dandelion, mints, etc... I use to loose trees all the time before I started to polyculture my trees. Now they help rather than destroy. Hmm, Garlic, onion, mint, tansy. Pungent stinky stuff, check. I'm also broadcasting chard, tah tsai, pac choi, poppy, pumpkin, squash, salsafy seed that I collected this summer. Some of these are hybrid and some most likely cross-pollinated. Out in the orchard to fend for themselves. 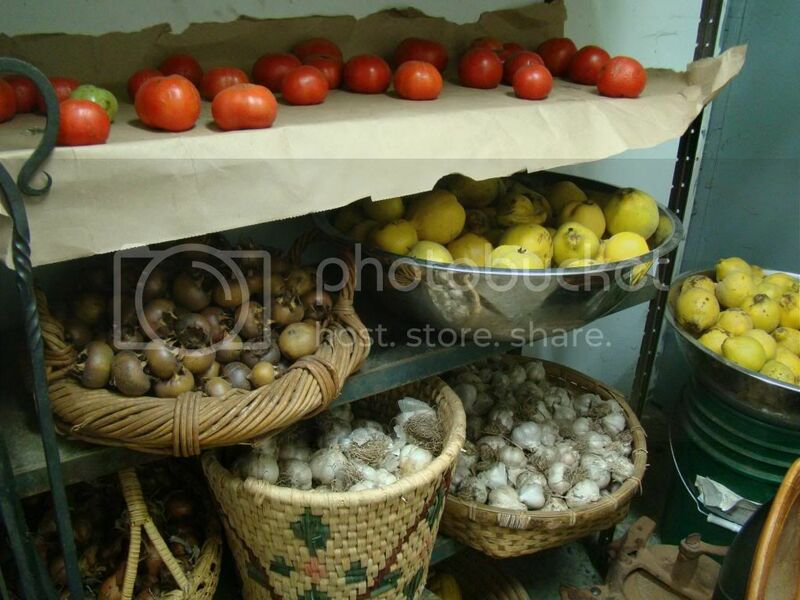 I have more Music garlic than I can eat, so I will be planting many cloves in the orchard tomorrow. Before the Seahawks game. The far end of the garden I have a simple worn compost system. A 33 gallon garbage can with a few holes in the bottom. No lid. I keep a 5 gallon bucket upstairs on the porch that I fill with kitchen scraps. Like someone else described their's, "more of a slop bucket". When it's about 3/4 full, I take it down and dump it in. Not forgeting to call the worms to the trough. Here worms, worms, worms, here worms worms. Sooee! I gave this fork load to the ducks. Protein boost. I also pulled a few carrots and checked on the garlic bed.